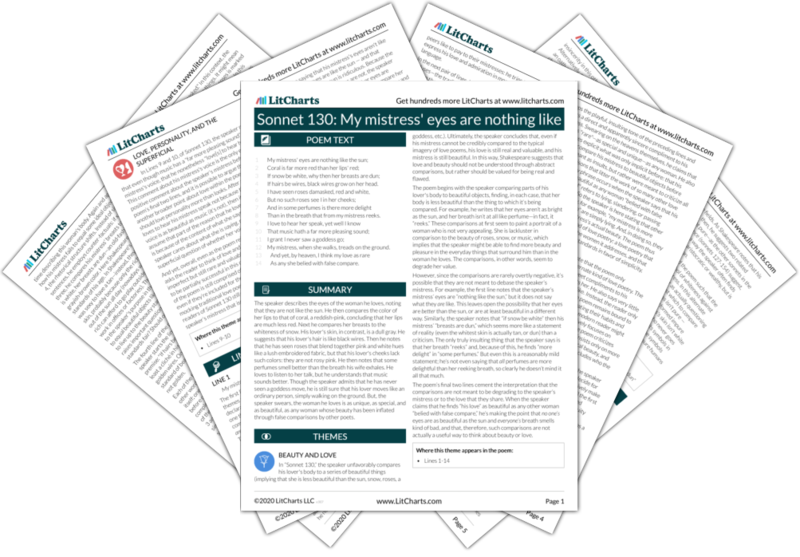 Instant downloads of all 945 LitChart PDFs (including Sonnet 130: My mistress' eyes are nothing like the sun). "Sonnet 130" was written by the English poet and playwright William Shakespeare. Though most likely written in the 1590s, the poem wasn't published until 1609. Like many other sonnets from the same period, Shakespeare's poem wrestles with beauty, love, and desire. He tries to find a more authentic, realistic way to talk about these things in the sonnet, and gleefully dismisses the highly artificial poems of praise his peers were writing. Shakespeare's poem also departs from his contemporaries in terms of formal structure — it is a new kind of sonnet—the "Shakespearean" sonnet. 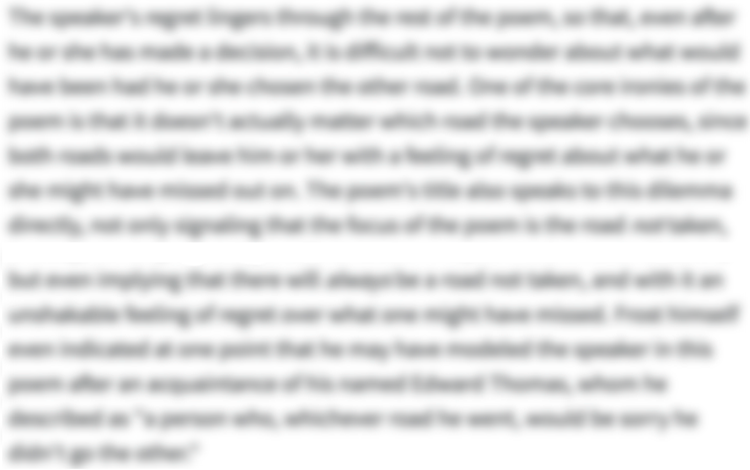 You can read the full text of “Sonnet 130: My mistress' eyes are nothing like the sun” here. Get the entire guide to “Sonnet 130: My mistress' eyes are nothing like the sun” as a printable PDF. Download it! 14 As any she belied with false compare. Unlock all 402 words of this analysis of Line 1 of “Sonnet 130: My mistress' eyes are nothing like the sun,” and get the Line-by-Line Analysis for every poem we cover. Unlock all 602 words of this analysis of Lines 2-4 of “Sonnet 130: My mistress' eyes are nothing like the sun,” and get the Line-by-Line Analysis for every poem we cover. Unlock all 534 words of this analysis of Lines 5-8 of “Sonnet 130: My mistress' eyes are nothing like the sun,” and get the Line-by-Line Analysis for every poem we cover. Unlock all 408 words of this analysis of Lines 9-12 of “Sonnet 130: My mistress' eyes are nothing like the sun,” and get the Line-by-Line Analysis for every poem we cover. Unlock all 763 words of this analysis of Lines 13-14 of “Sonnet 130: My mistress' eyes are nothing like the sun,” and get the Line-by-Line Analysis for every poem we cover. Unlock all 151 words of this analysis of simile in “Sonnet 130: My mistress' eyes are nothing like the sun,” and get the poetic device analyses for every poem we cover. Unlock all 141 words of this analysis of metaphor in “Sonnet 130: My mistress' eyes are nothing like the sun,” and get the poetic device analyses for every poem we cover. Unlock all 169 words of this analysis of parallelism in “Sonnet 130: My mistress' eyes are nothing like the sun,” and get the poetic device analyses for every poem we cover. Unlock all 87 words of this analysis of end-stopped line in “Sonnet 130: My mistress' eyes are nothing like the sun,” and get the poetic device analyses for every poem we cover. Unlock all 255 words of this analysis of enjambment in “Sonnet 130: My mistress' eyes are nothing like the sun,” and get the poetic device analyses for every poem we cover. Harryette Mullen's "Dim Lady" — Read the full text of Harryette Mullen's "Dim Lady," a rewriting of Shakespeare's Sonnet 130. "Sonnet 130" Glossary — A glossary and commentary on Sonnet 130 from Buckingham University. 1609 Quarto Printing of Shakespeare's Sonnet 130 — An image of Shakespeare's Sonnet 130 as it appeared in its first printing, in 1609. Reading of "Sonnet 130" — Ian Midlane reads "Sonnet 130" for the BBC, introduced by some smooth jazz. Blazon Lady — See an image of Charles Berger's blazon lady and read Thomas Campion's contemporaneous blazon. Sidney's Astrophil and Stella #9 — Read the full text of Sidney's earlier blazon, Astrophil and Stella #9. Altman, Toby. "Sonnet 130: My mistress' eyes are nothing like the sun." LitCharts. 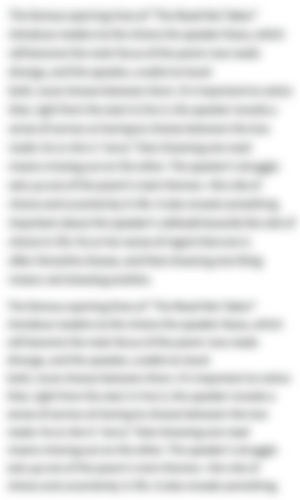 LitCharts LLC, 23 Jan 2019. Web. 16 Apr 2019. Altman, Toby. "Sonnet 130: My mistress' eyes are nothing like the sun." LitCharts LLC, January 23, 2019. Retrieved April 16, 2019. https://www.litcharts.com/poetry/william-shakespeare/william-shakespeare-sonnet-130-my-mistress-eyes-are-nothing-like-the-sun.